Les Arcs in France is a ski resort located in the Savoy region, in the Tarentaise Valley. This is a kind of "gateway" to the famous ski area «Paradiski». Les Arcs has trails for skiing for every taste and level of preparation. Modern architecture, well-equipped slopes, some of which are open at night, a lot of entertainment at relatively democratic prices make the resort popular place of all categories of tourists, including families with children and the youth. Les Arcs resort is located in the heart of the Tarentaise Valley, one of the parts of the French Alps. Along with La Plagne and Peisey-Vallandry, they are part of the Paradiski area (more than 400 kilometres of trails). 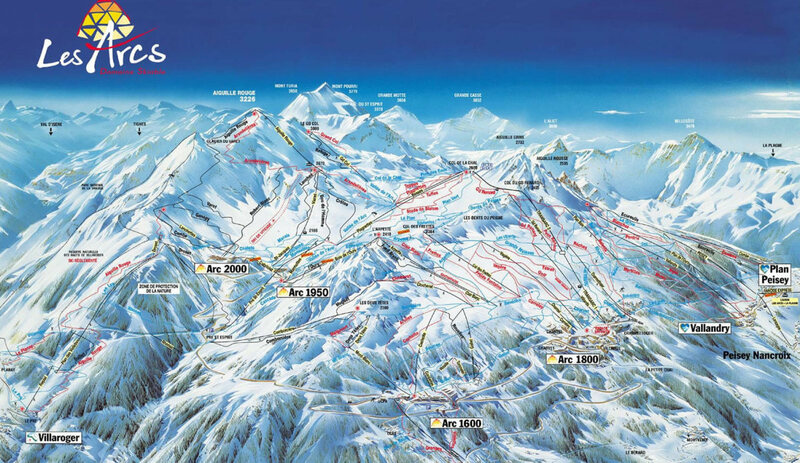 Les Arcs developed progressively and today consists of five skiing areas - Burg Saint Maurice, Arc 1600, Arc 1800, Arc 1950 and Arc 2000. The altitude ranges from 810 to 3225 meters, although the full ski area starts at an altitude of 1200m, and the main routes are situated above 2000m that guarantees good snow cover. Les Arcs is attractive not only for the variety of trails but also for the shortest distances from hotels to ski lifts. The price of your transfer will be based on several factors. Here at Alps2Alps, we do everything to keep our basic rate uniquely beneficial through the whole season. Even if you will be travelling at the height of the season, we still guarantee the lowest prices for ski transfers. All that will only result in our base-rate for ski transfers going down – Alps2Alps never make our prices growing. We always recommend our customers to book our services in advance, in order to get the best discounts. We usually offer significant shares for off-peak and midweek transfers to Les Arcs. (Monday to Friday prices up to 60% discount than at weekends). The final cost of your transfer will also depend on vehicle availability, shuttle schedule, vehicle utilisation, road tolls and airport parking charges. If you have any specific requests or planning to spend your holiday in a big company, please contact us so we can discuss the possibility of your transfer. Les Arcs is a perfect place for ski travellers as well as the big companies of friends and family tourists. The resort provides a huge number of entertainments for every taste: cinemas, bars, restaurants, night discos, bowling (8 tracks), two open skating rinks (in Arc 1800 and Arc-2000). An indoor pool and sauna are located in Bourg St Maurice, a town at an altitude of 1000 m.
Les Arcs 1950, undoubtedly belongs to one of the best resorts for families with children, the station has a «Famille +» statute. For children, the "Cariboo's Club" mini club operates: there are groups for the youngest, from 9 months to 3 years old, and for those who only make their first steps on skis. It will not be boring for teenagers either: there are special programs for skiing and snowboarding schools in the region for those who like freestyle or want to improve their skills. As the ski season will be coming, the prices will be growing rapidly. Book your transfer right now to get access to the best prices. If you want to ask some more questions or you can’t find the information you need on our web page, don’t doubt to call our customer service specialists and be sure, they will consult you: Alps2Alps customer service contacts.